Nothing could be easier than growing rhubarb. This perennial practically grows itself. Our house came with an established rhubarb plant and I’ve done nothing but harvest stalks from it since we moved in. I haven’t had to do anything else! It’s so easy. 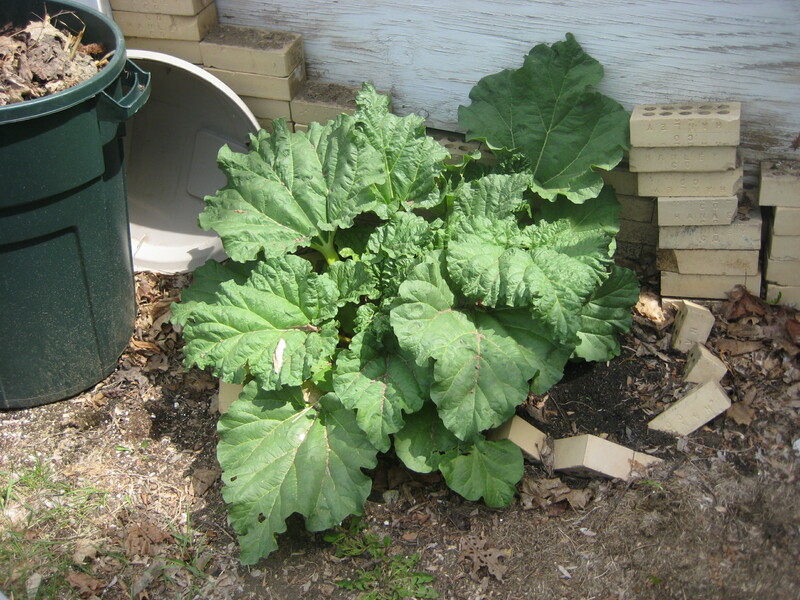 Our rhubarb plant in early May. This past summer, I thought it might serve us well to put some rhubarb in the freezer, just in case we get a hankering for a taste of summer in the middle of January (as tends to happen). 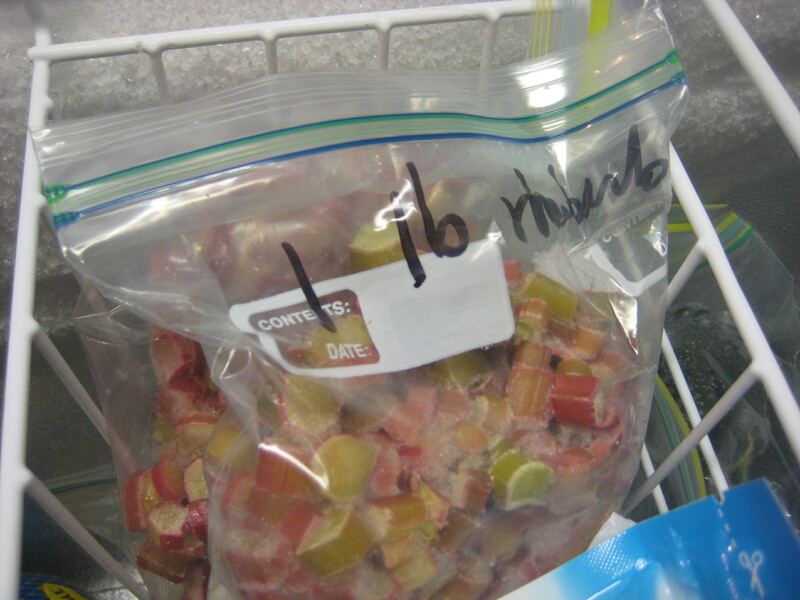 Marking the amount on the outside of the bag, I set the washed, chopped and bagged rhubarb into the deep freeze. Like my other time traveling foods, the rhubarb would be opened up again in another season, at another time… when it would seem somewhat exotic and out of the ordinary. Several months in the freezer would elevate it from commonplace to commodity. Rhubarb in the deep freeze. After thawing in the refrigerator, the rhubarb is now ready to be made into something special–a rhubarb pie. A tart and tangy treat to punctuate our dull January existence. A nice change of pace from the heavier holiday desserts we are now trying to forget (or exercise off of ourselves, whatever the case may be). For this pie I’ve decided to kick it old school, REALLY old school, and break out Betty Crocker’s 1951 Picture Cookbook. 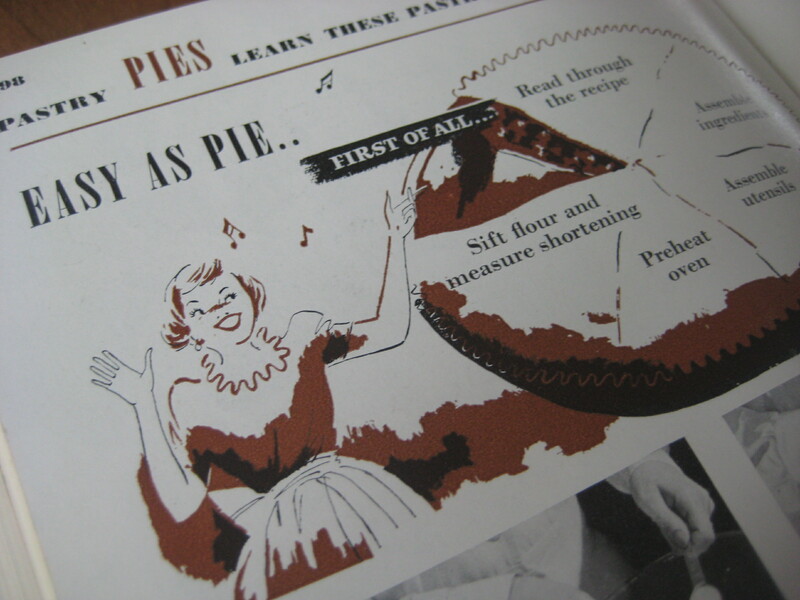 This book just screams pie to me. The red and white cover, the cute illustrations of homemakers in aprons. And from what I can gather from my extensive mid-century cookbook reading, this was a time in America when people often did sit down with each other and enjoy a slice of pie and a cup of coffee (made in the percolator of course). I have been thinking of making the rhubarb pie recipe in this book for a while now, and the time has come. 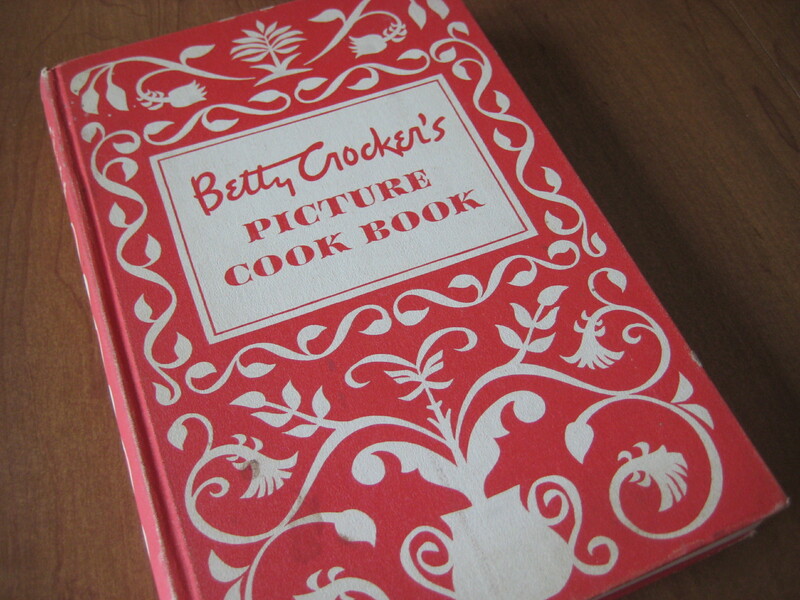 Betty Crocker's Picture Cookbook: Kitchen companion of many a 1950's housewife. What could be easier than pie? I must go put on an apron and pearls. 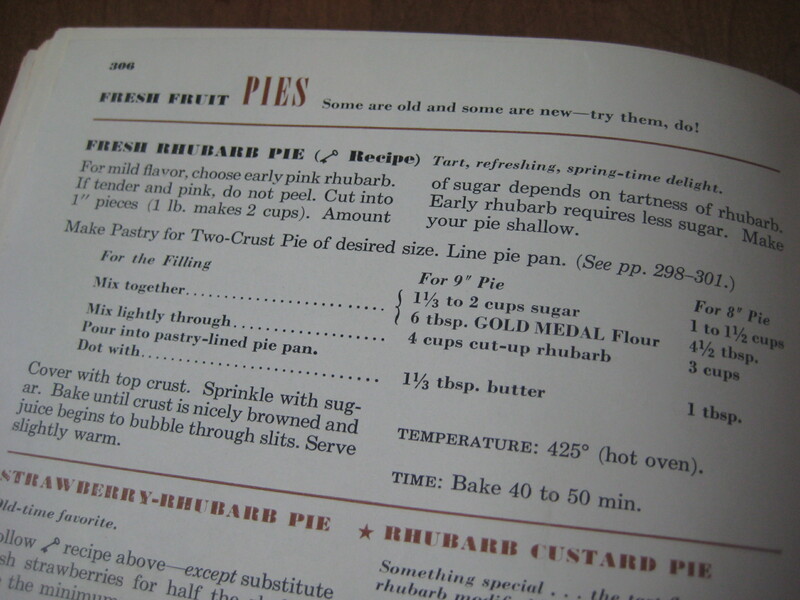 Recipe for Rhubarb Pie, and several practical variations for when you want something "special". Mmmm… hello summer. This will be great with coffee. Rather than a percolator, I use a Keurig. But the sentiment will be the same. I’m sure Betty Crocker has a fine recipe for pie dough. But my favorite pie dough recipe comes from my Gourmet cookbook, and can be found online HERE. It combines butter and shortening to achieve tasty and flaky results. It never fails. Pie dough can time travel too. It’s handy to have a few discs of dough in the freezer for when things start coming up in the garden. Rhubarb pie of course, but how about a savory tomato pie or a salmon and swiss chard quiche? Empanadas, spinach tarts or any sort of fruit galette would be tasty too. Don’t forget the classics–berry or apple pie, yum! When is a rhubarb a rose? Sometimes it’s the little things in life–like a slice of rhubarb pie and a cup of coffee–that remind us to slow down, savor life, smell the roses as they say. Enjoying my rhubarb harvest in the middle of January is a sweet-smelling rose among winter’s thorns. 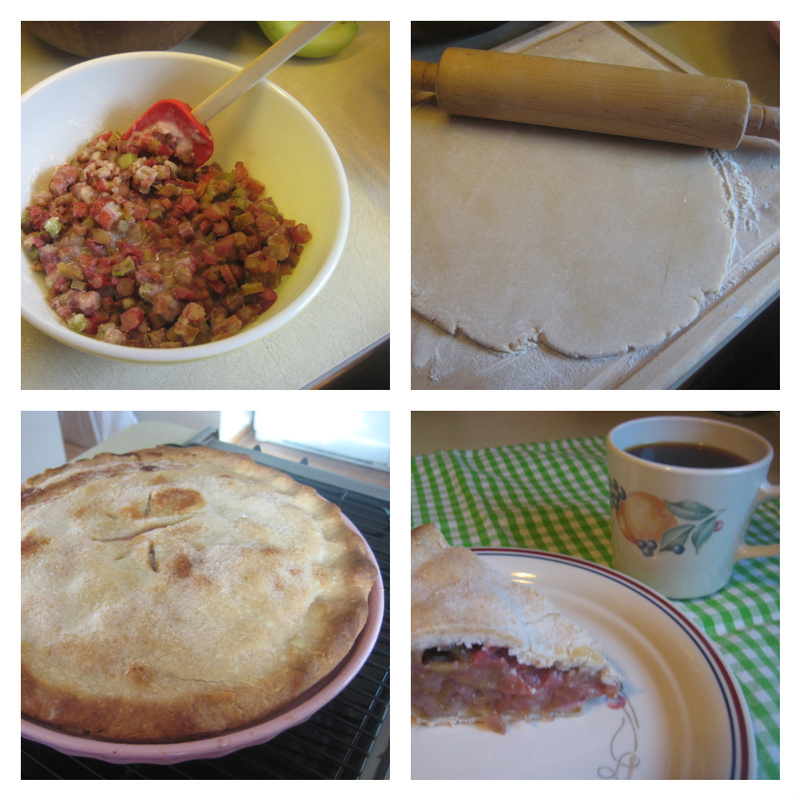 This entry was posted in Cooking, Fruit and tagged baking, betty crocker, coffee, freezer, frozen rhubarb, pastry, pie dough, preserving, rhubarb, rhubarb pie. Bookmark the permalink. love the pink pie plate! Oh and the whole post. Ruharb always reminds me of Grandma Slabaugh..she always got the recipe just right….not to sweet, not to tart. yumm..send me a piece right now please. Thank you for the lovely pink pie plate. 🙂 It’s now my very favorite. I was wondering if you’d see it in the photo. Mmm. Pie and Keurig. I love my Keurig – thanks again for the inspiration! I have been meaning to try my hand at a few pie recipes, but I always seem to be short on time. Someday 🙂 Wonderful pics.